Want to enjoy a great day out but hate the frustrating process of buying tickets online? 365tickets makes it easy to purchase tickets to some of the world's top attractions at the click of a button. And with a 365tickets voucher code you can enjoy fantastic savings too! So whether you want to treat the kids to a day at a theme park or visit some historic attractions, a 365tickets voucher will help you enjoy yourself for less. Founded in 1997, 365tickets was established to provide a simple, easy-to-use outlet for purchasing attraction tickets online. Dedicated to providing the very best customer experience, they're at the forefront of ticketing innovation – being the first company to introduce print-and-go ticketing way back in 1999. Today, they have sold over 1 million admissions to attractions around the world, with thousands of happy customers returning time and time again. Because 365tickets buy all their tickets direct or via an authorised agent, there is no middle man – meaning that they can offer all their tickets at gate price or below. And because they have contracts with a large number of different suppliers, they can offer fantastic combination entry deals that just aren't available anywhere else. So if you're looking for the best rates on tickets and an excellent level of customer service, 365tickets is the place to go. 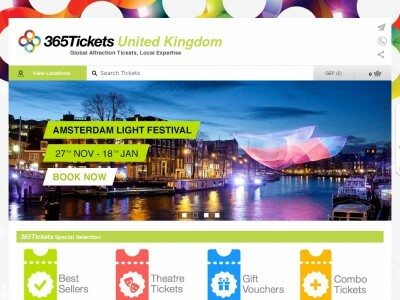 At 365tickets customers can browse through a fantastic selection of attractions, exhibitions, theme parks and historic landmarks in both the UK and abroad in order to plan the perfect day out. Whether you're just heading to London for the day and want to purchase advance entry for popular attractions like Madame Tussauds or the London Eye or you're off on holiday to Florida and want to get a deal on buying entrance to multiple parks, 365tickets will help you plan your holiday in the easiest and most cost-effective manner. You can choose from world-famous theme parks, activity days like flying experiences or luxury car driving, sports stadium visits, West End shows and much, much more. Once you've chosen your tickets, getting hold of them couldn't be easier. Choose from either a convenient print-and-go service to print your tickets at home, or opt to have them posted to you via secure first class post. Want to get exploring with 365tickets? With a 365tickets voucher code you can get great deals on admission to some of the world's favourite attractions – and some fantastic hidden gems as well. So whether you're planning a family day out or some thing to do on a romantic weekend away, a 365tickets promo code will help you save the pennies. Browse our website until you find a 365tickets voucher code that suits you, then navigate to their website to begin shopping. Click on an attraction or activity for more information. Choose a ticket type and click 'Add to basket'. Enter your 365tickets promo code in the box provided and click 'Apply'. If you've enjoyed shopping for tickets with 365tickets, you might want to make a holiday of it with great deals on accommodation at sites like Hotels.com and Booking.com. Or, if those aren't up your street, you'll find plenty more stores to browse in our Travel section. Enter your 365tickets voucher code in the box provided and click 'Apply'. Choose a payment type and click 'Proceed to checkout'. Enter your payment details and click 'Buy tickets' to complete your booking. Need to contact the team at 365tickets? Whether you have a question about your booking, want to know more about multiple booking deals or simply want to find out how you could make fantastic savings with a 365tickets voucher, you can contact the Customer Services department by telephoning 0800 368 7668. Want to find out more about what's happening at 365tickets? Why not follow the company across your favourite social media platforms? You'll find lots of interesting content such as competitions, attraction news, promotions and more. You can also use these pages to find out more about saving money with a 365tickets voucher code. Don’t forget to check them regularly, as you can never be sure when a free 365tickets promo code might be waiting for you! Buy now online at www.365tickets.co.uk. My young son is a complete roller-coaster fanatic – but it can be really expensive to take him to all the theme parks. That's why he was so excited when I found a 365tickets voucher code online. We can use our 365tickets voucher at 365tickets.co.uk to get great deals on entry to some top attractions in the UK and abroad. Thanks to our 365tickets promo code, he's already sampled some of the best roller-coasters in the country and a few in France and Spain! So why not see what your family could save with a 365tickets voucher code?